With the SmackDown Women’s Championship hanging high above the ring, BECKY LYNCH must defend her coveted title against ASUKA and CHARLOTTE FLAIR in the first-ever TRIPLE THREAT WOMEN’S TLC MATCH. With the SmackDown Women’s Championship hanging high above the ring, BECKY LYNCH must defend her coveted title against ASUKA and CHARLOTTE FLAIR in the first-ever TRIPLE THREAT WOMEN’S TLC MATCH. DANIEL BRYAN makes his first title defence as WWE Champion when he takes on AJ STYLES. RAW Women’s Champion RONDA ROUSEY looks to settle unfinished business against NIA JAX. And a brotherhood becomes a battlefield when former Shield members SETH ROLLINS and DEAN AMBROSE collide for the Intercontinental Championship.‘Tis the season for some TLC. No, not Tender Loving Care. 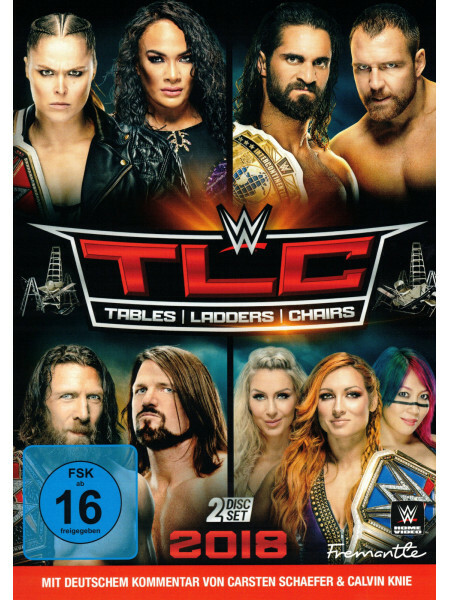 Tables, Ladders and Chairs!